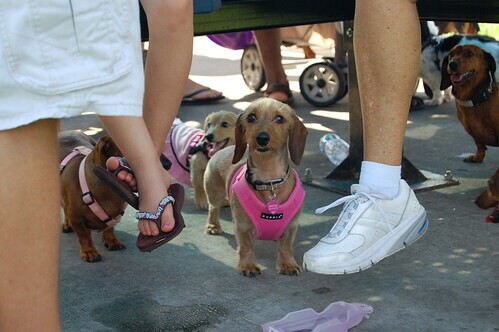 saturday, the meetup group had wiener races. and there were winners. just not us. not even close. as in, these dummies barely made it out of the box. winnie actually got the furthest, because when someone (human) started running behind her, she hauled booty running from him. but then she veered off the track and got disqualified. oh well, there's always next year. to see an example of my weentards in action, here's video from last year's races with riley and dash. i had to set the camera and then walk around, so skip to about 2 minutes in to get to the races. oh, and look, winnie's under the table. Winnie looks so hopeful and timid there. Love her pink harness lol. This must have been fun to watch!